Head and abdomen about 20mm. Seemed to be intent on bending this leaf into a tube. Don, I'm envious! Of the genus Misumena. Sp, not sure. This female is guarding an egg sac. You can see the silk that has bound the leaf. She hadn't actually had a sac yet, and hadn't proceeded very far in bending the leaf. I have some additional pictures of this if you would like them. I plan to return on Sat or Sun to see how it's comming. Right, sack that notion. It's probably a resting place; a makeshift cocoon. 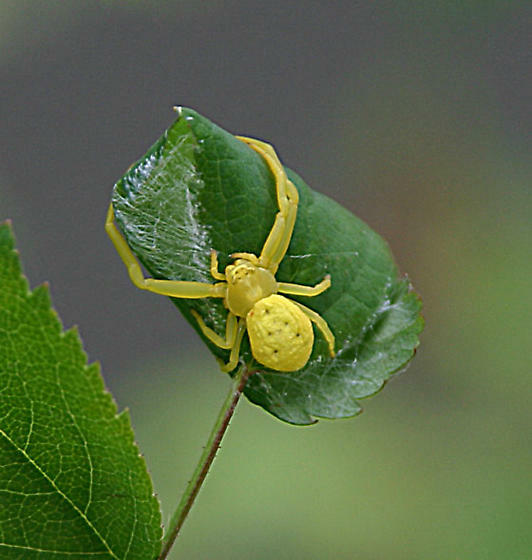 The spider's grip breaksdown the leaf's durability. I have no idea how long this grip would need to be maintained. It's too early for egg laying. Maybe even early for mating.